American Alpine Institute guides three routes on Denali. The standard and most commonly climbed route on the mountain is the West Buttress. 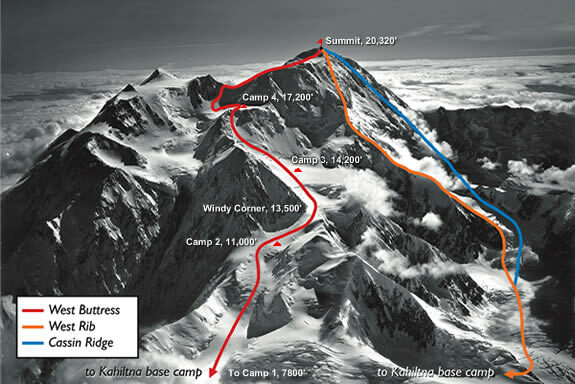 The West Rib is substantially more difficult, and the Cassin Ridge is among the world's most classic hard alpine routes, with steep ice and technical rock climbing at altitude. The West Buttress route on Denali was first surveyed and eventually pioneered by Bradford Washburn on assignment from the Boston Museum of Science. Washburn and company were the first people to climb the West Buttress and did so in July of 1951, establishing what is now the normal or most popular route on the mountain. The first ascent of Denali's lower North summit was made in 1910 by a group of prospectors who undertook the climb as part of an elaborate and well funded bet that they were too old and out of shape to climb such a mountain. The higher South summit was reached in 1913. The first winter ascent of the mountain didn't occur until 1967. The account of this historic feat is detailed in the book Minus 148 Degrees, by Art Davidson, a member of the climbing party. In each of the following sections, you will find a summary of the route, including elevation gains and distances as well as photos from each portion of the route. We hope you enjoy learning more about this incredibile expedition and mountain.